Contact me today; I’ll guide you toward becoming the best student you can be! I offer private tutoring for high school and college students at all levels of proficiency. Whether you need regularly scheduled sessions throughout a semester, short-term assistance preparing for an exam, or a single meeting to complete an assignment, together we can devise a plan to help you achieve your scholastic goals. I’ll meet you anywhere in the world via Skype! Why hire me as your academic tutor or test-prep mentor? Convenient: I offer private online sessions from anywhere in the world! Flexible: Scheduling is arranged to accommodate your busy life. Evening, weekend, and holiday sessions are available. Motivational: I’ll guide you toward achieving your highest potential by offering tips to make studying fun and by encouraging you to reach beyond your current level of accomplishment. Personalized: I devote one-to-one attention with focus on addressing your individual needs, personal attention that’s not possible in a traditional classroom setting or test prep center. Supportive: I will set attainable goals, require accountability, measure progress, and show you how to structure your study time outside of tutoring sessions. Tailored: I design each lesson with you in mind and do not use a standardized curriculum. Discover for yourself The Mary Difference! Contact me today to get started. Standardized test results could mean the difference between acceptance vs. rejection, scholarship funds vs. full pay, or white-collar vs. blue-collar position. 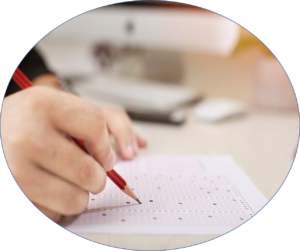 Since your future academic career and your employment income may be impacted by exam outcome, private test-prep tutoring is worth your investment! Practicing ineffective habits will not yield effective results. It’s important to pinpoint your problem areas and learn the academic concepts that underlie the questions you struggle with most. It’s imperative, too, to utilize a process of elimination to get rid of wrong answer choices. You don’t have to do it all alone. I am here to assist you by introducing you to my unique fourfold approach! Contact me today to get started on your path toward victory! Click for a series of information based on students’ questions. There is more to getting ready for higher education than simply taking the ACT and SAT exams. Your common app and supplemental essays need to be drafted, too. If you’re feeling overwhelmed by one or more of these necessary tasks, allow me to assist you. As your academic coach, I’ll help you present to potential colleges and universities the best version of YOU!